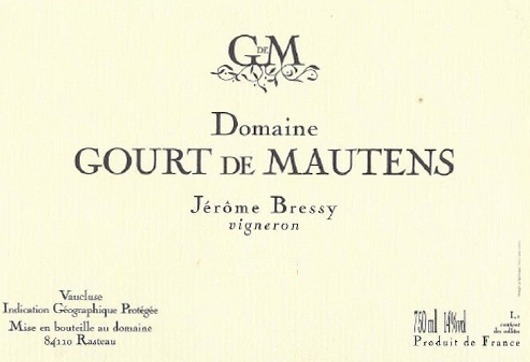 Gourt de Mautens is a family owned winery located in Rasteau that started in 1996. In 1998, Jerome Bressy took over the 13 hectares of vineyard and for him it was a dream come true. Next the winery and the ageing cellar were built. This is the insider’s wine of the Southern Rhone. Many winemakers in the Rhone Valley, Christophe Delorme (Domaine de la Mordoree) included, feel that Jerome Bressy will be making the best wines in the entire Southern Rhone Valley in the future. Jerome chose the options of small yields (8-15 hectoliters/hectare) and organic farming (now controlled by Ecocert) along with the use of homeopathy, which he considers essential conditions for making a great wine. Since 1989 they have not used any chemical fertilizers or pesticides on the vines, so the soil can give what it has to give in the most natural way. The yields have always been lower than average because of his father’s concern about grape quality. The estate took another step forward in the organic farming by becoming biodynamic in 2007. The Domaine produces an average of 2,000 cases each year, red and white wine, both of equal quality (not quantity), from small different plots in Rasteau. These are homogeneous wines as each plot is farmed with the same concern for perfection, regardless of any difference in quality among them. The goal being to be at nature’s service, stepping in the process only when necessary. The name of the Estate, "Gourt de Mautens", is the name of the area where part of the vineyard and the family farm are located. This name dates back to 1635. In provencal dialect "Gourt" means a place where the water flows from and "mautens" means bad weather. Thus, it is an area where water flows from chalky clay marly soil when it rains. "This is one of the sensational estates in Rasteau, with proprietor Jerome Bressy farming just over 20 acres of vines. Organic farming and the naturally low yields of his old vines (8-15 hectoliters per hectare) result in wines of extraordinary concentration and intensity." The vineyard measures 13 hectares (32 acres) and is made of several parcels planted on terraces, hillsides, banks and plateaux with a northwestern and southwestern sun exposure. The soils are made of clay and limestone marls. Most of the vines are 45-90 years old, only 1/3rd of them is 5-30 years old. On some parcels different varieties can be found on the same row, just like it used to be in the ancient times. Red : 70% Grenache ; 30% Carignan, Mourvèdre, Syrah, Counoise, Muscardin and Vaccarèse. Green harvest of the younger vines. A first selection is done in the parcels during the harvest (the grapes that are not selected are left on the ground). The wine is then bottled without fining or filtering, allowing us to retain the natural and expressive character of the wine. wine which is both beautifully rich and pleasingly elegant. It has rich ripe stone fruit in abundance with honeysuckle notes and an exceptionally mineral palate. An excellent full bodied Rhone style.